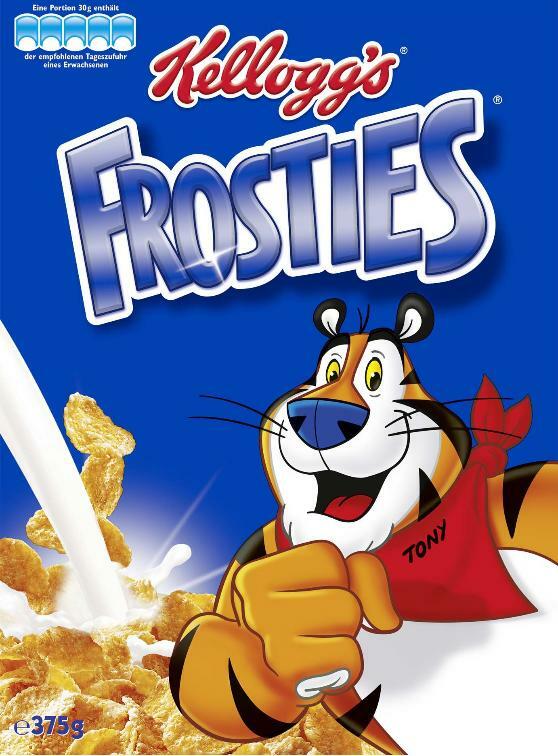 Kellogg’s Frosted Flakes (Frosties in Europe) is a breakfast cereal first introduced by the Kellogg Company. It consists of corn flakes “frosted” or coated with sugar. 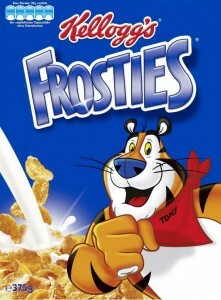 The “Frosted Flakes” name is used by Kellogg’s in United States and Canada. The cereal was first introduced in 1951 as Sugar Frosted Flakes. The word “sugar” was dropped from the product in the 1980s during a time when many cereals dropped “sugar” from their titles. “Frosted Flakes”, by itself, is purely a description of the product. As a result, that term cannot be trademarked and can be used by any company making a similar product; thus, on boxes, the words “of corn” are added below the Frosted Flakes logo. By contrast, “Kellogg’s Frosted Flakes” and “Frosties” are registered trademarks in their respective markets. 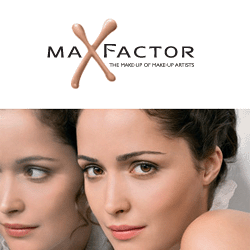 After immigrating to the United States in 1904 Max Factor moved his family and business to Los Angeles, California, seeing an opportunity to provide made-to-order wigs and theatrical make-up to the growing film industry. Besides selling his own make-up products he soon became the West Coast distributor of both Leichner and Minor, two leading theatrical make-up manufacturers. During the early years of movie-making, greasepaint in stick form, although the accepted make-up for use on the stage, could not be applied thinly enough, nor where did colors work satisfactorily on the screen. Factor began experimenting with various compounds in an effort to develop a suitable make-up for the new film medium. By 1914 he had perfected the first cosmetic specifically created for motion picture use — a thinner greasepaint in cream form, packaged in a jar, and created in 12 precisely-graduated shades. Unlike theatrical cosmetics, it would not crack or cake. It was worn for the first time by actor Henry B. Walthall, who served as the model for screen tests. 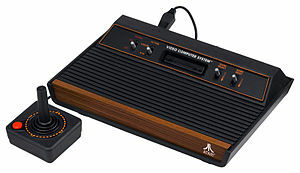 The console was originally sold as the Atari VCS, for Video Computer System. Following the release of the Atari 5200, in 1982, the VCS was renamed “Atari 2600”, after the unit’s Atari part number, CX2600. The 2600 was typically bundled with two joystick controllers, a conjoined pair of paddle controllers, and a cartridge game—initially Combat and later Pac-Man. The Atari 2600 was wildly successful, and during much of the 1980s, “Atari” was a synonym for this model in mainstream media and, by extension, for video games in general. Bounty is a chocolate bar manufactured by Mars Incorporated and sold internationally. It is not marketed in the United States (with the exception ofWorld Market and international sections of many supermarkets), where a similar product, Mounds, is marketed by Hershey’s. Bounty was introduced in 1951 (UK/Canada). It has a coconut filling enrobed with milk chocolate (sold in a blue wrapper) or dark chocolate (sold in a red wrapper) and is one of the few chocolates to come wrapped in two individual halves. Since 2006, a cherry flavoured version has also been available in Australia. This was originally a limited editionflavor, but then became officially available (Now discontinued). In Europe, a limited edition mango flavour was available in 2004-05 and now (2010) is in Russia and Ukraine. 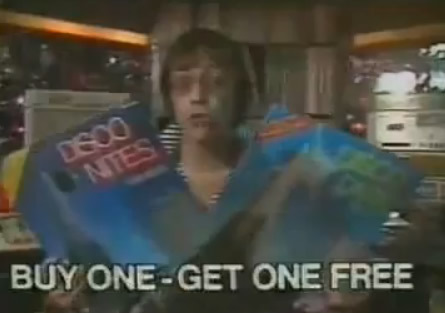 Its television advertising has tended to feature tropical beaches with coconut palms.